Overlooking Eyre Square in Galway City Centre. Next to the train and coach stations. Known far and wide as the city of tribes, Galway City is the thriving hub for culture and tourism in the west of Ireland. With beautiful beaches along its coasts and a buzzing social atmosphere both day and night, the city is a pleasure to explore. The fashionably cobbled streets are filled with colourful shops and boutiques offering the high standard of retail therapy we all need from time to time. Known also for for the many festivals it plays host to throughout the year, including the Galway Arts Festival and the Galway Food Festival, the city of Galway is undoubtedly a hot spot for tourism in Ireland. In the Heart of Galway City, standing proudly over Eyre Square, is the majestic Hotel Meyrick. Formerly known as the Great Southern Hotel, Hotel Meyrick has served over 6 million guests since it first opened it’s doors back in 1852. It was designed by the renowned architect, John Skipton Mulvany, to be an iconic structure that would proudly welcome visitors from far and wide with its impressive design and the high level of grandeur it would provide its guests. Mr. Mulvany’s vision continues to thrive today as the staff of the Hotel Meyrick continue to live up to and indeed exceed the quality of hospitallity he sought to provide. The moment you walk into the splendid marble floored lobby with its open fire and chandeliers, you feel as though you’ve arrived. There’s a variety of rooms, all beautifully adorned, which include standard rooms as well as Junior and Executive suites. All rooms come with internet access, interactive TV systems, sound systems and mini-bar as standard and are, as you might expect, just as beautifully decorated as everywhere else in this magnificent hotel. Hotel Meyrick also provides its guests with a wonderful spa and health club which features state of the art cardio fitness equipment, a relaxation room and a weight management area, as well as a jacuzzi, steam room and even an outdoor Canadian Hot Tub, all surrounded by large windows offering patrons breathtaking scenic views of the city. Come dinner time, there’s no need to venture out in search of food. The Oyster Grill Restaurant is superb, with a focus on gourmet dining using only the finest seasonal ingredients to provide its diners with an extremely high standard of cuisine in a warm and welcoming environment. Or, if it’s just a drink you’re after, head over to their Oyster Bar for a cocktail or a pint with views of Eyre Square in this handsome Victorian style venue. 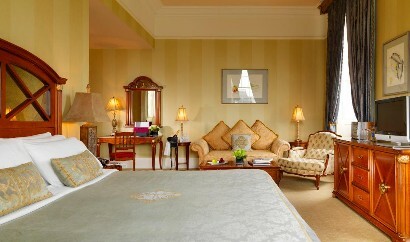 The only thing I don’t like about the Hotel Meyrick, is leaving.